Exploring latest developments in blockchain and financial technology solutions. Advancements with Ted Danson is proud to announce pre-production on an episode surrounding recent breakthroughs in blockchain technology. 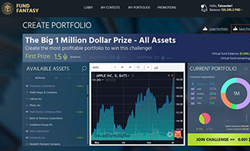 Featuring FundFantasy, a Daily Fantasy Trading platform, viewers will learn about the technology behind the platform, and how it enables users to compete for prizes by crafting the ultimate portfolio. This episode is scheduled for broadcast 3QTR, 2018. Check your local listings for more information. The show will shine a light on FundFantasy's contests, their smart contract infrastructure, and their relevance in today's markets. "The platform has everything I have ever wanted for myself as an online trader: it's fun and social rather than serious and lonely, it's transparent and provably fair, and it can pay out just as well. It's perfect," said Tal Zander, CEO & Co-Founder for FolkSoft and the FundFantasy project. "FundFantasy's blockchain-based technology makes playing both fun and secure," said Michael Devine, senior producer for DMG Productions and the Advancements series. The Advancements series is an information-based educational show, targeting recent advances across a number of industries and economies. Featuring state-of-the-art solutions and important issues facing today's consumers and business professionals, Advancements focuses on cutting-edge developments, and brings this information to the public with the vision to enlighten about how technology and innovation continue to transform our world. Backed by experts in various fields, and a team dedicated to education and advancement, DMG Productions consistently produces commercial-free, educational programming on which both viewers and networks depend. For more info, please visit: AdvancementsTV.com [AdvancementsTV.com __title__ ].